Two's Company Tozai Lavoisier 7 Hinged Flower Vases is a stunning addition to any room. 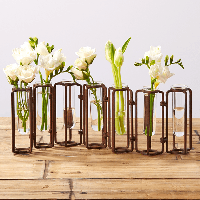 With 7 individual glass tubes housed in a hinged Antique Gold holders this vase will show off your floral display. Makes a great addition to the the dinning room table, entryway, or credenza.